HOME / TRENDING / ‘BAAR BAAR DEKHO’ TRAILER OUT! 5 TIMES BOLLYWOOD WAS A HOLLYWOOD MOVIE IN HINDI! ‘Kala Chasma’ made us dance like crazy, kickstarting our curiosity to watch the movie ‘Baar Baar Dekho’. It’s your lucky day guys, because the trailer is out! It shows some major similarities to a Hollywood film, which made us wonder – how many Bollywood films out there are practically Hollywood movies in Hindi ? The answer is - way too many. So we listed down a few that caught our eye. The trailer starts off with Jai( Sidharth Malhotra) who finds himself travelling through time. He tries to change his past with Diya(Katrina Kaif) in order to alter his future. This resembles the plot in the Hollywood movie ‘About Time’ where the exact same thing happens! This movie is also being compared to others like ‘ The Time Traveller’s Wife’, ’13 Going on 30’ and ‘Click’. Hopefully this movie is as good as Katrina in a red bikini, because we’re still excited! The movie comes out on 9th September,2016. 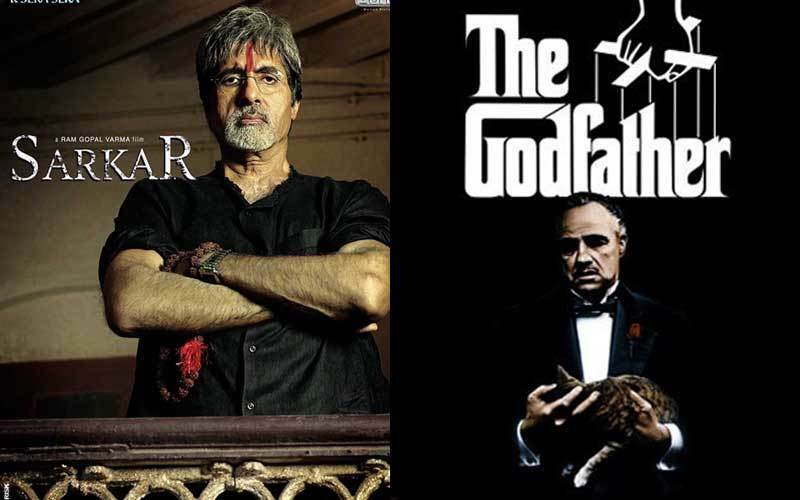 Director Ramgopal Verma credits the movie ‘ The Godfather’ for inspiring him to become a filmmaker. Thus, he decided to direct the remake ‘Sarkar’ starring Amitabh Bachchan. This Hollywood movie in Hindi is about a man working above the law trying to maintain a moral code that the government fails at. Amitabh Bachchan, being the legend that he is, was able to perfectly portray the silent but deadly personality of ‘the Godfather’. 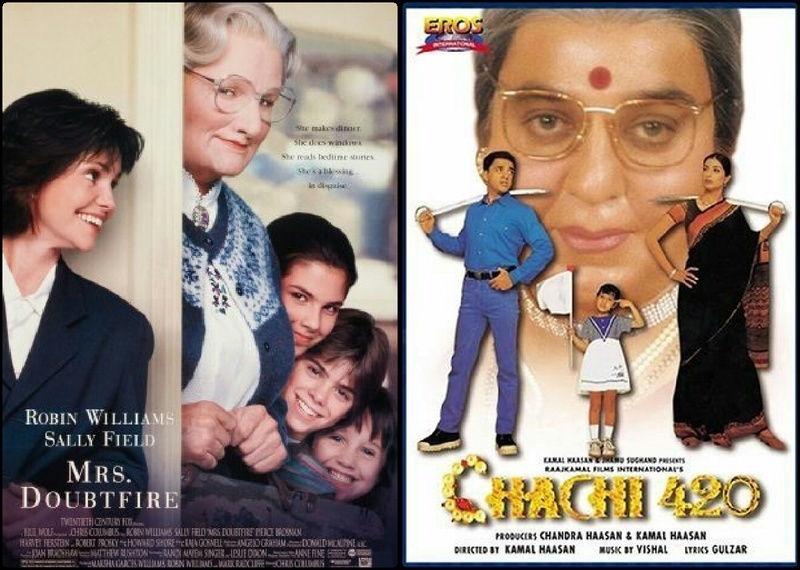 Oscar-winning Robin Williams played the role of Mrs.Doubtfire, whereas Kamal Haasan played the role of ‘Chachi’ in Chachi 420. Both men play divorced husbands that cross-dressed as old nannies so that they could spend time with their children. The difference is the crazy bike stunt Chachi does at the end of the movie, along with many others. One silly difference is that a bus driver develops a crush on Mrs.Doubtfire, but the house cook falls in love with Chachi! This romantic comedy stirred up quite a controversy because of it was literally copying the ‘Hitch’ Hollywood movie, in Hindi. Starring Salman Khan and Govinda, it was one of the highest grossers for Salman Khan. 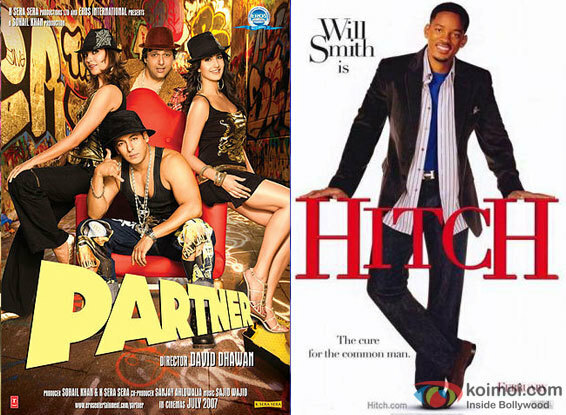 Sony Pictures, owners of the movie ‘Hitch’, sued the Indian producers for copyright infringement. This was the first time an Indian entertainment company was called out on their plagiarism by an international company. Bang Bang! didn’t fall into any trouble with the law because it was an official remake of the movie Knight and Day. One of the major differences is the object everybody’s running after. In Bang Bang!, it’s the stolen Kohinoor diamond that’s got everyone worried. In Knight and Day, it’s the ‘Zephyr’, a battery that never dies. Oh, and let’s not forget, Bang Bang! had lots of singing and dancing! Thought Hollywood movies in Hindi are the only things Bollywood do? There are plagiarized Bollywood movie posters too!